Xaat Disi is a game I have been working on for a very long time. One day soon I hope to finish it, but for the time being it remains the masterpiece that I’m never satisfied with. Xaat Disi is an homage to my homeland, Alaska. The game tells two stories about salmon. First is the story of how salmon travel hundreds of miles up streams, past countless dangers, to breed and then immediately die. The second is of how important salmon are to the animals and people they interact with on their journey. 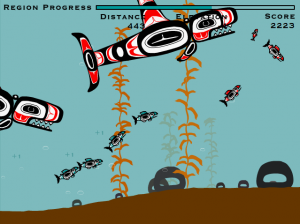 The art in the game is inspired by the beautiful, traditional art of the Tlingit people from the southeast of Alaska, while the whole piece itself is an attempt at something like the game equivalent of a nature video. 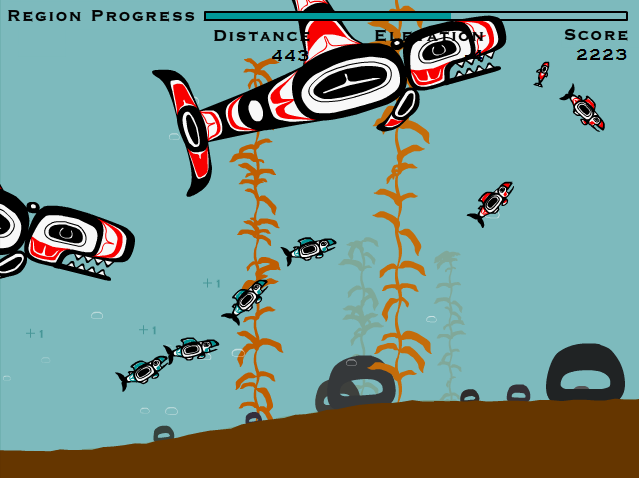 The game is fairly simple, requiring only a single button to control your school of fish as they travel through various levels. 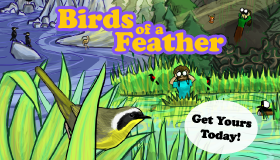 However, the technology behind it is fairly sophisticated, including a world generator to ensure that no two games are the same as well as detailed AI to simulate a living ecosystem. Ultimately, my goal is to raise awareness about the rapid decline of wild salmon in many places around the world, despite how important that they have been to every culture that has had contact with them. Xaat Disi is currently not released, but I hope you’ll see a post soon about how it’s finally out!